Taking couples photos is SO MUCH FUN. Seriously. 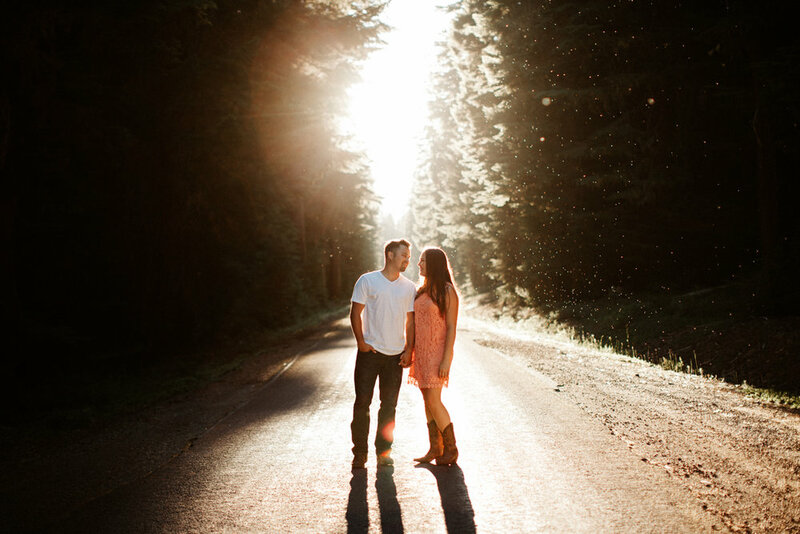 I absolutely love to turn my engagement sessions and couples shoots into half-day adventures to rugged, beautiful locations. 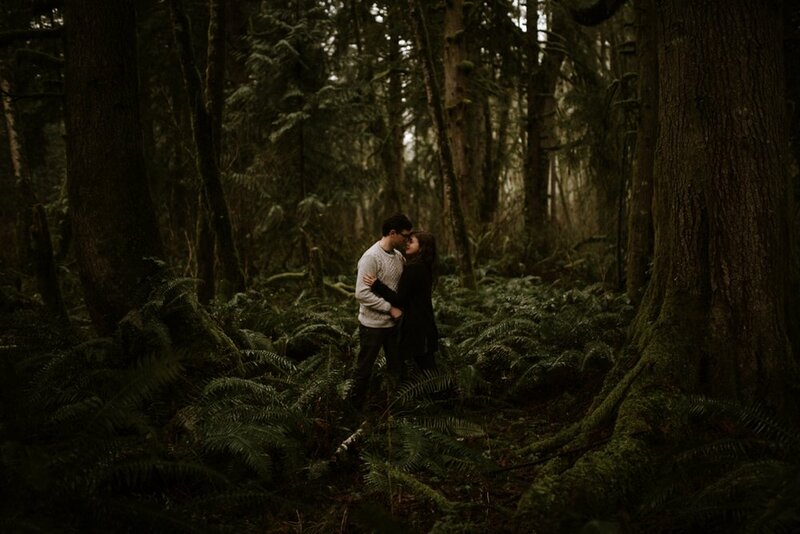 Think of it as an epic day spent making memories with your love - hiking, laughing, even popping a bottle of champagne in the woods - just with a photographer there to join you! 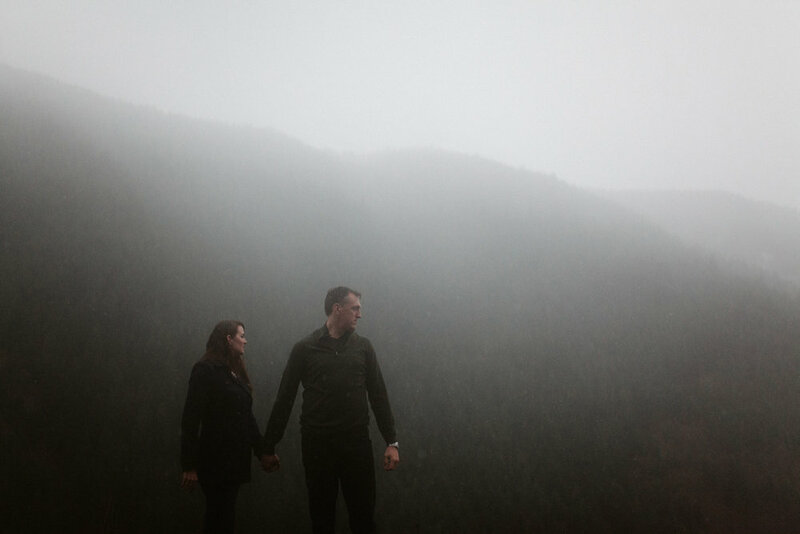 WHY ARE COUPLES PHOTOS IMPORTANT? 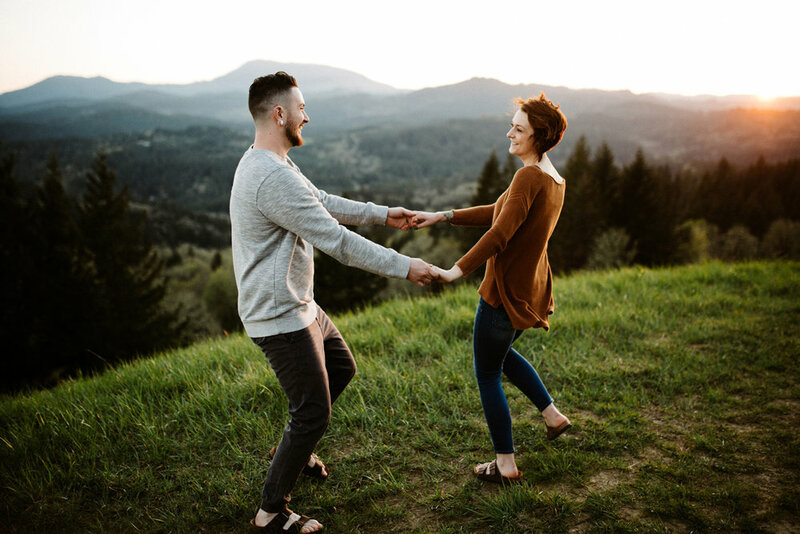 Doing an engagement session, couples session, or anniversary shoot gives you an opportunity to take some AMAZING photos together on a day that is much less stressful and busy than your wedding! Plus, it gives you the opportunity to take photos anywhere, without many time-restrictions! And, if I'm also shooting your wedding, it gives you the opportunity to see how I shoot, and get a little more used to being in front of the camera! 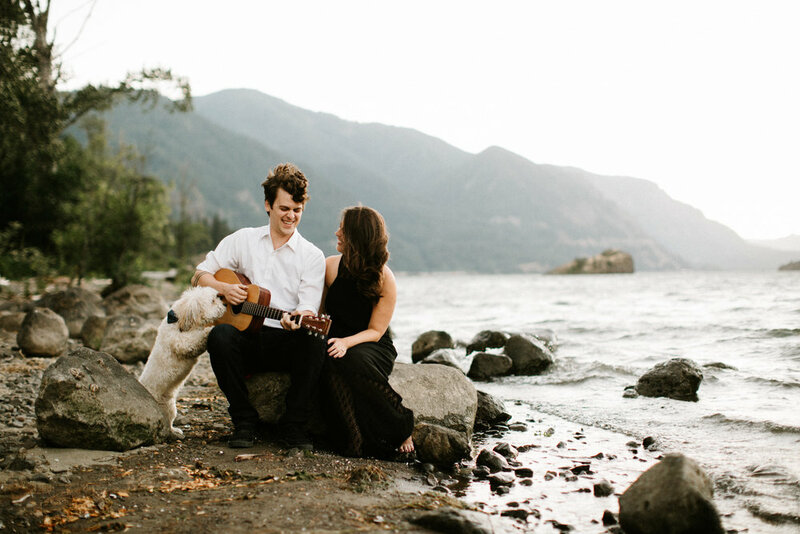 WHEN IS THE BEST TIME TO DO ENGAGEMENT PHOTOS? 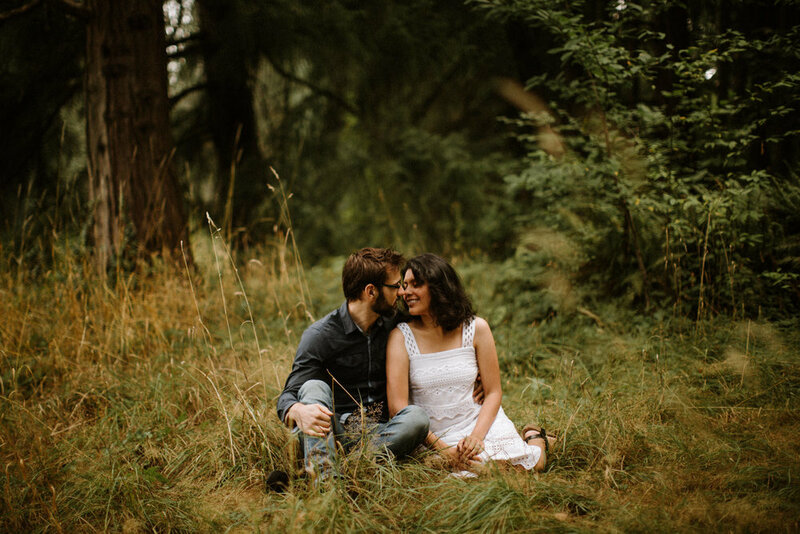 I shoot engagement photos year round, in any type of weather (rain, snow, sun, you name it!). I typically book sessions at sunset or sunrise for the best romantic lighting, but I often block out more time to make sure we can travel to our locations and arrive at the perfect time of day for the most flattering light! I also always try to carpool if we are going anywhere far away - it saves gas and it helps us get to know each other better! First of all, pick your favorite clothes that make you feel the most confident and comfortable! Make sure that everything fits SUPER well, and remember that baggy clothing can make you look bigger than you actually are. If you have a certain part of your body that you don't like, don't wear clothes that show it off! For example, if you feel really self conscious about your arms, don't wear a sleeveless dress! Also, take into consideration where we are shooting and bring shoes and clothes that are cute but also practical. If you are wearing stilettos and a super tight clubbing dress in a forest, it's going to look out of place. As for colors, I prefer to photograph people in neutral colors and solids because I want the focus on you, your love, and your emotion, not on your clothing! Simple patterns and plaids are okay too - but remember to bring several options so we can pick and choose! It's a good idea to avoid really bright, fluorescent colors because the light can bounce off the clothing and into the shadows of your face, adding a weird color cast to the image! When in doubt, stick to richer, deeper tones or neutrals. Deep reds, burnt oranges, mustards, soft or darker blues, and olive greens always look good. Just avoid the really really bright shades. One other thing to consider is that some tight, high-contrast patterns can create something called a "moire effect" where a weird color or third pattern emerges. This mostly happens with shirts that have tiny, close together, contrasting stripes - so definitely avoid those too! When the two of you are creating outfits together, it's a good idea to coordinate, but don't get matchy-matchy. Pick a general color scheme and play around with it! For example, if one person wears a plaid shirt with multiple colors in it and dark pants, have the other person pull one color out of the plaid and wear a shirt or dress in that shade. Layering also looks good, especially with pieces that are structured and have good texture, like leather or denim jackets. "HOW DO I CHOOSE A LOCATION?!" We all have places in our lives that make us feel relaxed and at peace, or places that hold special memories and meaning. Choose a place for your photos that feels like YOU. I usually tell my couples to either find a place that is special to them and their relationship, OR pick a spot you've always wanted to explore together, and make some new memories there together during our shoot! I'm always happy to suggest ideas based off what you have in mind! Unfortunately there are a few places that are strict about the use of commercial photography on their premises (such as the Pittock Mansion and the Japanese Gardens in Portland). In case you need any ideas for locations around the Portland area, feel free to consider this list of my favorite spots! Want to book an engagement session, couples shoot or anniversary session? Great! Just email me! From there, I'll set up a phone call so I can get to know you a bit and hear your story. 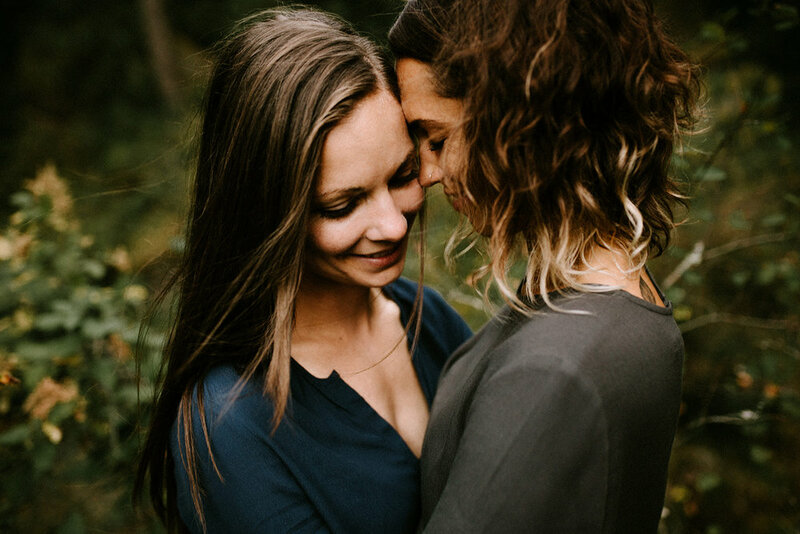 You can choose from my three different engagement/couples collections, or you can book a wedding collection that also includes engagement photos. To book, I'll just send you an electronic contract and invoice. After that, we'll start planning locations and I'll help answer any questions you might have about outfits, etc. On the day of the shoot, we'll meet up and carpool somewhere amazing! This will allow us to take spontaneous stops, crack jokes, and get to know each other on the way. I always recommend bringing booze too if you like to drink - it will help loosen you up AND make the day more fun! After the shoot, I'll upload the photos and get rid of anything awkward, out of focus, or a duplicate, and then I will put the rest in a private online gallery and send them to you as proofs right away. They will be straight out of my camera at this stage, but you will able to look through them all and choose your favorites for me to edit and retouch. Each of my collections has a specific number of final images, so depending on which one you get you'll be able to choose 20, 50, or 75 images for me to edit. Once you finish selecting your favorites and email me, it will take two weeks for me to edit them and get them back to you! When I'm done I'll send you a second online gallery where you can download them directly or order any prints you might want! Email me! Or reach out on Instagram! And feel free to browse through my blog to see full sessions!